Spider Mites - Applied Bio-nomics Ltd. I chose spider mites as my first pest discussion because they are, for the most part, the most common, most damaging and most broadly based pest. The two spotted spider mite is a significant pest in greenhouse vegetables, greenhouse flowers, cut flowers, cane fruits, orchards, plantscapes, bedding plants, and the list goes on and on. For many years, we have been publishing and updating our crop recommendations and, after all of those years, I have decided that I have been largely repeating myself. The strategies for dealing with spider mites are quite similar throughout our customer base. So, this is an attempt to generalize and hopefully simplify our approach to managing spider mites. Starting this discussion is like the “chicken and the egg”. Where does the pest start? Based on our experience, and for this discussion, the best place and time to start is in the middle of the summer. In general, what you are experiencing in the middle of the summer will be what you will experience at the same place and time the following summer. Robin Rosetta, in Oregon, did an experiment to see when spider mites in outdoor nurseries began their diapause, their over-wintering behaviour. To be safe, Robin started her survey in early August in the Willamette valley. To her surprise she found that in early August a significant number of spider mites had already begun their diapause. We know that in many greenhouses spider mites returning from diapause can easily be seen well into July. So, the first point of this discussion is that, at any given time, there will always be some spider mites that are not going to be around for anything that you may want to do to them. There will always be some survivors. That being said, most of them are available and vulnerable during the summer months. This is when you need to effectively deal with them. If you can effectively deal with them during the summer, you will find that next summer they will be significantly reduced. When we inherit a new customer with spider mites, the first year can be very challenging. Because damage caused by spider mites is permanent in ornamental crops, we are usually coming in behind a failed chemical strategy. If we know this in advance, we usually decline the opportunity. That is not how life really works, so we usually approach the endeavour by pointing out that this is not the ideal way to start the program. The residual effects of a failed chemical program extend far beyond the actual chemical residues. 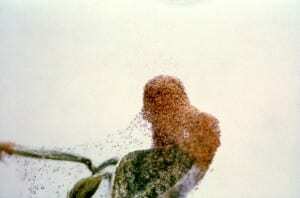 Repeated miticide applications stress the plants. The more that is sprayed, the higher the level of stress. 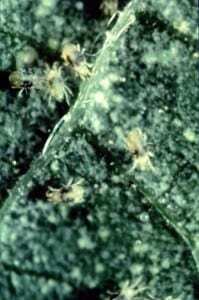 Spider mites love plant stress. The other thing that goes without saying, but always needs to be said, is that miticides don’t do a very good job of killing, or even controlling, spider mites, but they wreck beneficial predatory mites. The other huge problem with miticides is that their residual effects and, even more importantly, their sub-lethal effects can impair a biological program for up to 6 months.